Every city has its way of reminding you where you are, letting you know that—in fact—you couldn’t possibly be anywhere else but there. As if the golden Madonnina radiating her spiritual brilliance from the highest spire of the Duomo or the ubiquitous fashion models criss-crossing the city in search of hire aren’t reminders enough, Milan, like a woman gone a bit mad with her jewelry collection, has covered herself with her own seal. 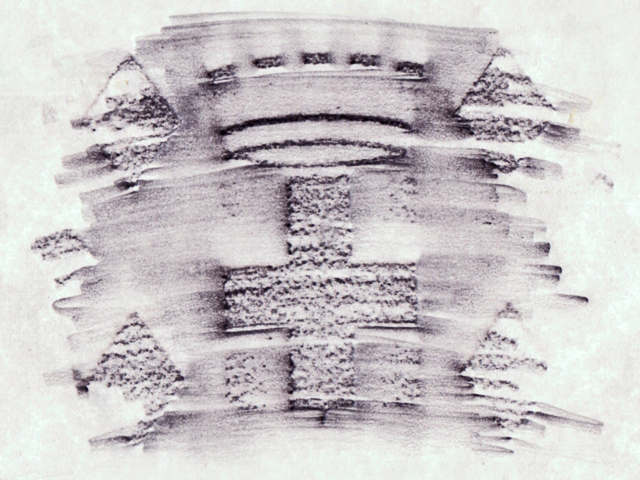 Officially, a silver shield bearing a red cross, crowned by an eight-turreted, crenelated wall wreathed by laurel and oak, and resting above a tricolored ribbon—this symbol with its roots firmly planted in the history of the city (Napoleon himself had something to say about the graphic design) is spread like buckshot across the surfaces of the modern metropolis. 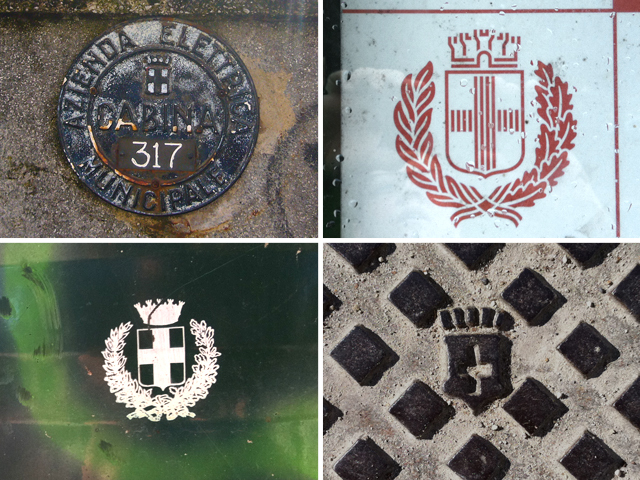 I’m fascinated by the many iterations of this emblem and by the places, often undignified, where it can be found. 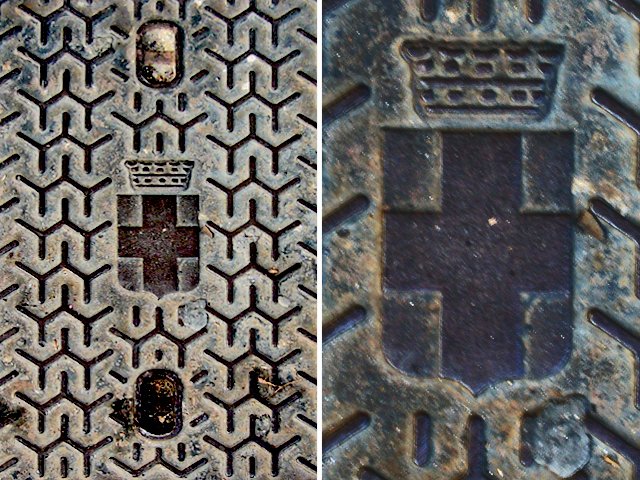 Public water fountains, man-hole covers, garbage cans—each wears its ornament proudly, even as it is camouflaged by the more visible signs of urban grit and the daily grind. How strange that this coat of arms, lo stemma, leaves such a strong impression on me. Or maybe it’s not strange at all. This is, after all, a city that has adopted me as much as I have adopted her. What impression, then, will I leave, what sign of my having been here? Maybe these humble writings and images are it. 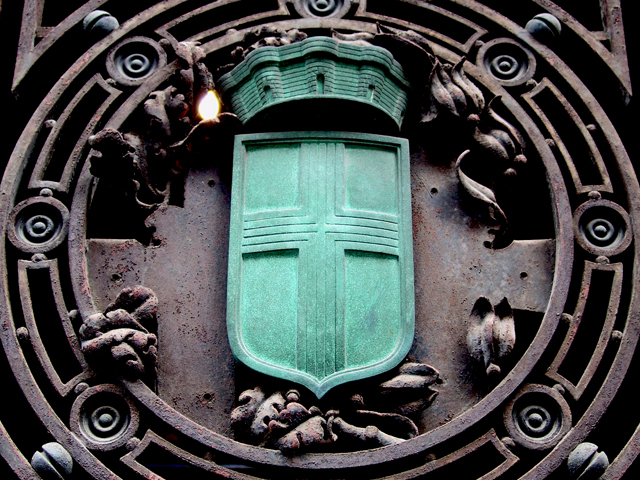 This entry was posted in AROUND US, ITALY and tagged coat of arms, MIlano, seal of Milan, stemma. Bookmark the permalink.